"Coming and Going is Why the Place is There at All" Tim Etchell's neon sculpture at the defunct Harbour Pier Station sums up Folkestone's unfortunate situation. The town has been devastated by the loss of the Cross Channel ferries. In spite of the glorious weather and the helpful Festival guides, first impressions were grim. The walk to the 'Creative Quarter' revealed a town of obvious and shocking poverty. It showed in the range of shops, in the people's clothes and in the amount of obesity and disability. I have never seen so many motorised wheelchairs and scooters in a town. I was visiting on a Thursday. It was market day and the main shopping street was crowded. I stopped for a coffee by the Guildhall museum. At first I thought I was beside one of the Triennial exhibits, because a crowd of people were climbing into and photographing a khaki coloured vehicle, which turned out to be a London omnibus used to transport troupes to the frontline during WW1. 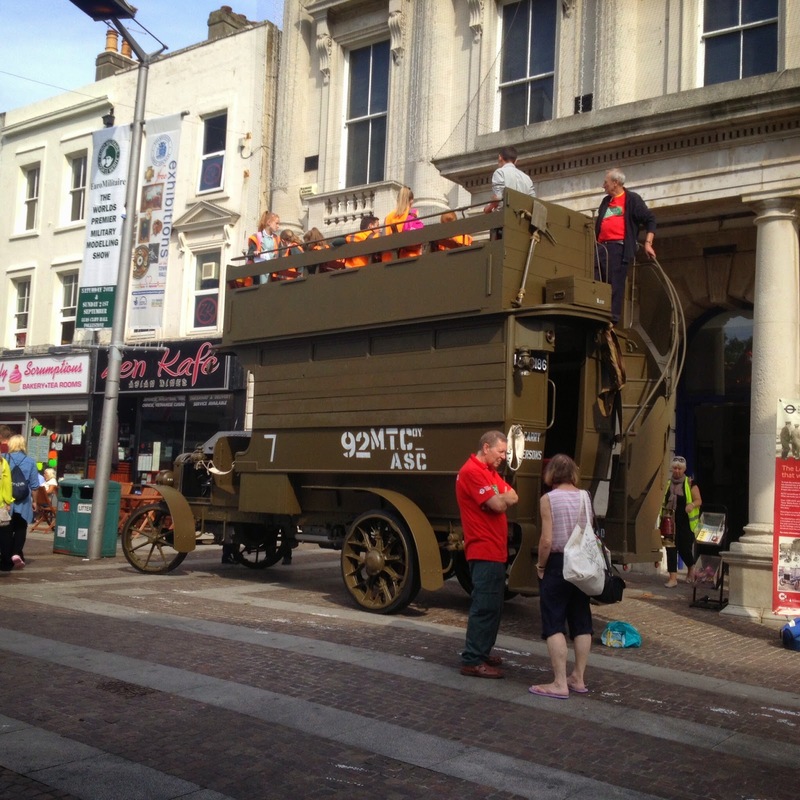 I later discovered that Folkestone has a popular charity, Step Short, supported by the Roger de Haan foundation, that has raised a lot of money for a monument and activities and events that remember the soldiers of WW1. But this is concerned with Folkestone's past. 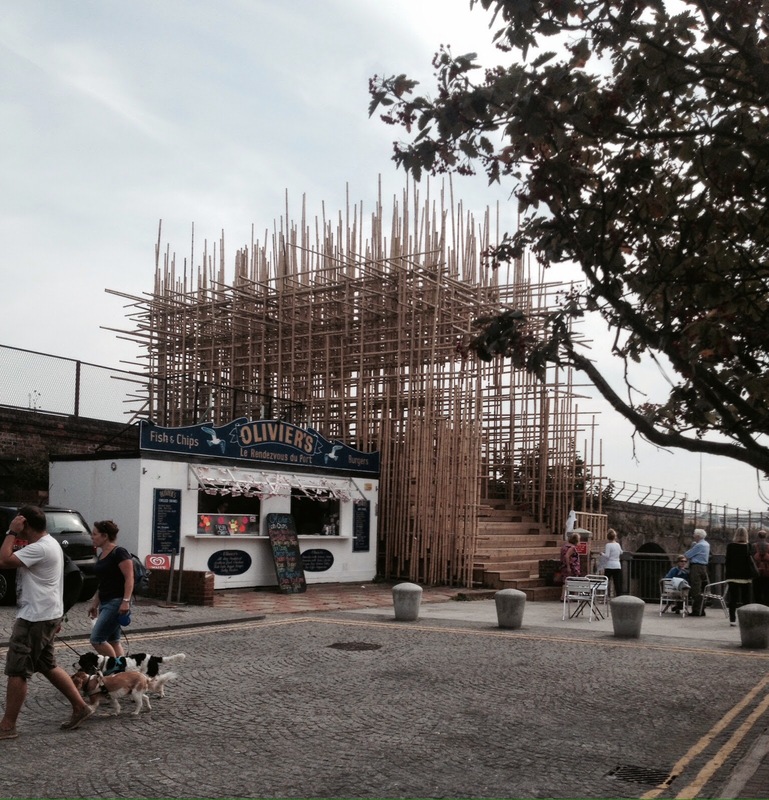 The Folkestone Triennial entitled 'LOOKOUT' is directed towards the future. The future of everything, including the town. There are 21 LOOKOUT artworks, widely scattered throughout the town, and other permanent works from previous Triennials. A day was too short to see them all. Walking and talking to whoever I met on my way, I asked their opinions of the town, and of the Triennial. The most publicised work is 'Folkestone Dig' by Michael Sailstorfer. Thirty pieces of gold, supplied by Triennial sponsors, worth 250.00 or 500.00 each, buried in the harbour sands. The idea was a treasure hunt, fun, participation, an ongoing possibly never ending artwork. Plus spades in the sand. It ticks all 'community involvement' boxes, but is it about Art or the Future? Not Art in my book, and as The Future it seems to me insulting to the locals. If I was as hard up as they appeared to be, would I be out there scrabbling about? The girl in the nearby cafe told me she had seen a piece of gold, and it was tiny. 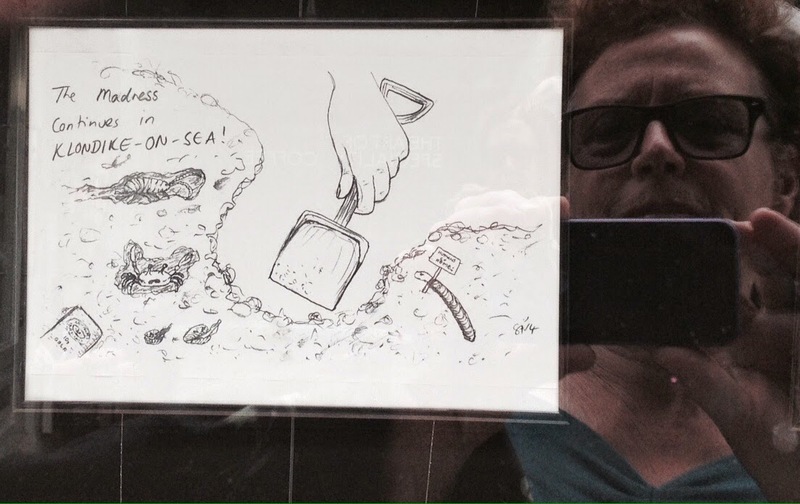 Here is a picture by 'The Bored Artist' seen in the window of a High Street gallery, showing what she thought of 'Folkestone Dig’. Quite a few artworks were hard to find, the green triangles being a bit too discrete. However Gabriel Lester's sculpture "The Electrified Line ( Cross-Track observation-deck) " was easy to spot. 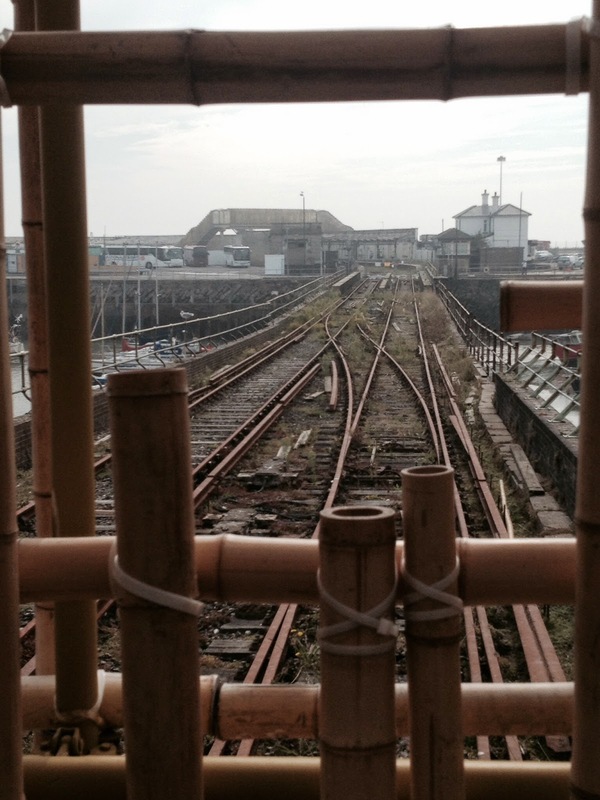 It is a bamboo scaffolding structure astride the railway line leading to the defunct Harbour Pier Station. The structure itself is attractive and frames views of the railway line and harbour and it immediately reminded me of New York's Highline. Several people told me that it may be converted to a garden walkway linking the Harbour with other parts of the Town. That could be a lasting pleasure and attraction. The Triennial literature talks about the coming 'Chinese Century' but I did not understandthe connection between Folkestone and China - it seemed an irrelevant attempt to connect two of the Artworks - the bamboo sculpture and Will Kwan's beautiful 'Apparatus #9' on the Lees- to the Festival concept of 'The Future'. Crossing the empty expanse of the quayside, now a huge deserted car park, I came accross the Folkestone Fringe housed in some old shipping containers. I really enjoyed Susan Trangmar's 'video 'Lunar Tides'. More than anything else I saw it related directly and poetically to the sea and to the future. In spite of all the chatty Festival guides at each official artwork, I felt the Triennial lacked vibrancy ( and weekday visitors) and needs a Fringe to bring it to life. Apparently The Fringe is larger on the weekends when the artists can be there to invigilate their work. Just around the corner I found the Harbour Cafe, the complete antithesis of the fancy showpiece Rocksalt Restaurant at the Fish Market. Here I had a cup of tea, a fried egg sandwich and an informative chat about Folkestone and the plans for its future. This seems very dependant upon Saga millionaire Roger de Haan, a big supporter of the Triennial. The fear is of a Folkestone for the wealthy few: second home owners, boat owners, or at best London commuters. Finally, encouraged by a fellow festival visitor I had seen on the train from London, I made a long trek in search of Pablo Bronstein’s Beach Hut in the Style of Nicholas Hawksmoor' . It was delightful. I hope they keep that one.